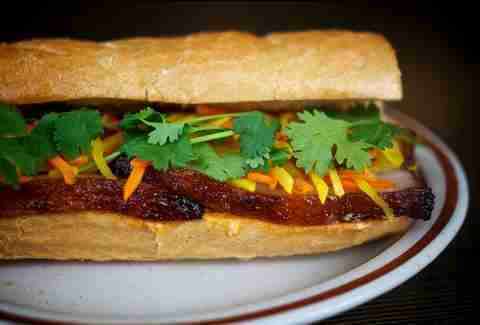 Some people might say that Meat Cheese Bread’s best sandwich is the green bean and bacon relish. Those people would also put a black bean patty on a list of their favorite burgers. If you couldn’t tell from its name, MCB’s strongest attribute is its simplicity. 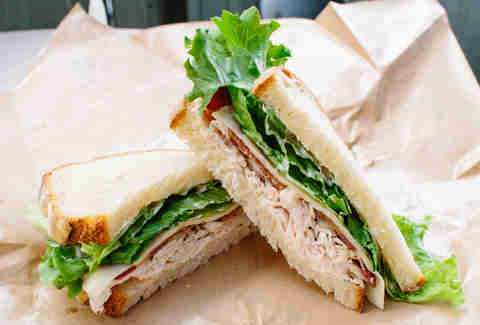 That’s why its roasted turkey on sourdough with havarti, bacon, sweet onions, mayo, and lettuce takes top honors for us. All that’s left to do is go to next door to their pub, Beer. 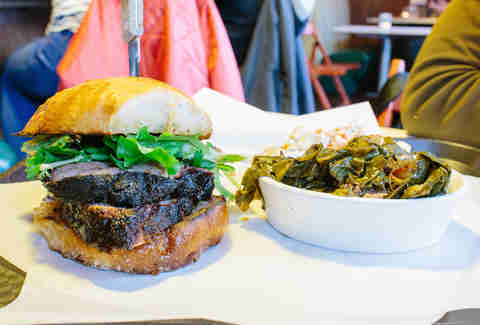 “Melty pork fat, charred meatiness, special glaze.” That’s the menu description for this sandwich. And, really, do you need to know more? No you don't, but we'll tell you that you're also getting the usual toppings of pickled carrot and daikon, aioli, cilantro, and jalapeño. Just 'cause we're nice. A former tacos by bike service, Güero has since become somewhat less mobile with two locations in bustling Northeast and Southwest cart pods. 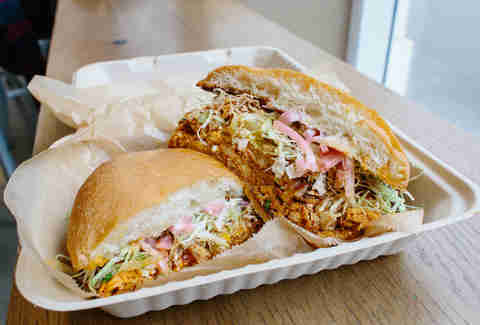 Focusing on Yucatecan flavors, Güero's two owners stumbled onto the city’s best tortas. 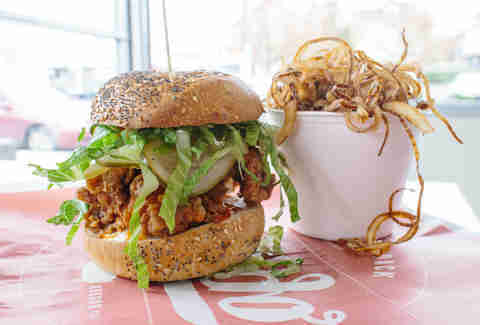 They use Veracruz Bakery, from over the river in Vancouver, to start, then add succulent braised meat and veggies. The best is their Yucatecan chicken, with a bright achiote marinade. Definitely upgrade with a fried egg and cotija. On form it’s the best Texas-style brisket in town, and this isn’t lost when you take the meat and throw it in the middle of a cheap, processed white bun. Especially not when you add the proprietary spicy barbecue sauce and a generous amount of pickles and onions. 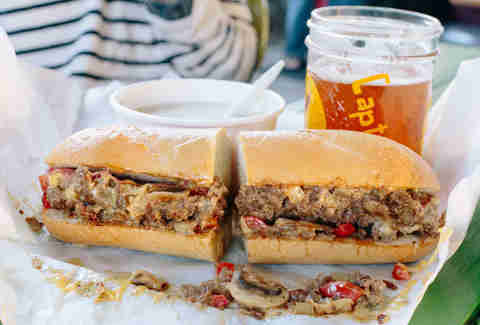 Of course Portland’s best Philly makes it on the list. This St. John’s food cart might advertise itself as the place to go for New England-style clam chowder (which it is), but the surprising specialty is its cheesesteak with the works. A soft bread filled with grilled steak, onions, two kinds of peppers, mushrooms, and American cheese AND wiz. 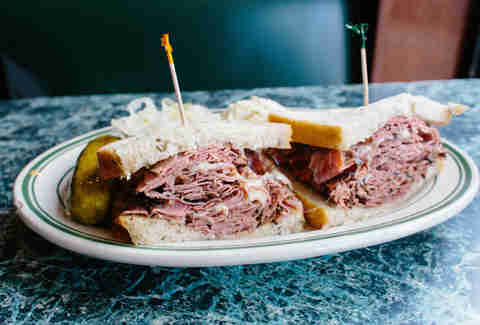 Considered by some as one of the best New York-style delis outside of the five boroughs, Kornblatt’s quietly sits in the trendy shopping thoroughfare that is NW 23rd Ave. Serving “Empire State Sandwiches” with Thumann’s corned beef and pastrami shipped from the East Coast (just don’t let anyone tell you its from the city, everyone knows the best meat comes from Jersey), the team here can build you Portland’s best hot pastrami in record time with quality rye, Swiss, and ‘kraut -- and when you get a chance, pick a side order of the macaroni salad. This is true Jewish comfort food. One of our favorite butcher shops (where else can you get a bacon sampler!?) 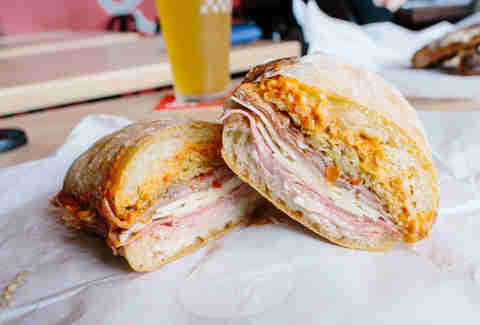 makes Portland’s best Grinder because all the meats are cured in-house. It’s as simple as that. Tails & Trotters uses slices of its house-cured coppa and ham, shredded iceberg lettuce, spicy house fennel relish, provolone piccante, and a smear of garlic aioli on toasted ciabatta. The tartness of the relish and the richness of meat and cheese mellow under the crunch of lettuce as you contemplate never eating a subpar Italian ever again. The Original Schnitzelwich comes from a small wooden food cart on the corner of 5th and Alder in Downtown Portland. Its Czech owners have been perfecting this sandwich for ten years now, coming up with the perfect ratio of breaded pork loin (or chicken breast), romaine, paprika spread, sautéed onions, and creamy horseradish on a dense ciabatta. The Presidential comes with a “slab of Munster” and a postcard. Because you’ll wanna tell everyone about what you just ate. 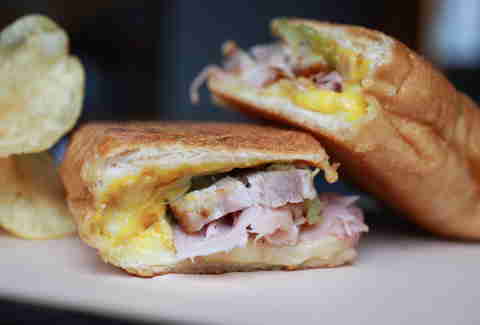 Widely lauded as the best Cubano in the world, Bunk’s rendition swaps the roasted pork for, what else, pork belly. When you top that with ham, pickles, and mustard on a French roll and throw it all in a panini press, well, you don’t have to be familiar with Jon Favreau to know this is a good sandwich. But don’t take our word for it. Everyone from local critics to Mario Batali have been preaching about it. After being named one of the 21 best sandwich shops in America, Lardo was guaranteed to have one of its creations mentioned here. The catch? Which one! Like picking your favorite Victoria Secret Angel (holla at me Adriana!) it’s almost impossible to get everyone to agree on the best. But in our opinion you can’t go wrong with the sometimes elusive Cold Fried Chicken. Take one of the world’s best leftovers, add iceberg lettuce, blue cheese dressing, horseradish, pickles, and a healthy amount of bacon and you’ve got yourself a damn fine sandwich. 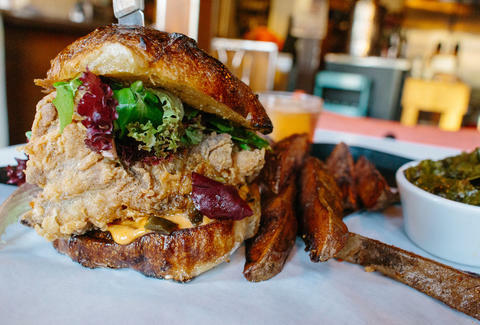 It should be no surprise that one of our favorite restaurants of last year AND one of the best fried chicken joints in the country takes top honors with its smoked pork shoulder sandwich. (Hell, we may as well include its smoked fried chicken too! See header image for reference.) These guys just know their way around smoked meat. 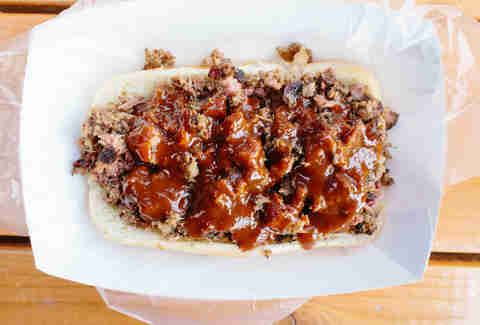 Take a homemade sourdough roll, coleslaw, a grip of their barbecue sauce, and enough sliced pork shoulder to make you reach for the Maalox and you have the best sandwich in town.